Delicious Emarti in beautifully Hand Crafted Rajasthani gift box. 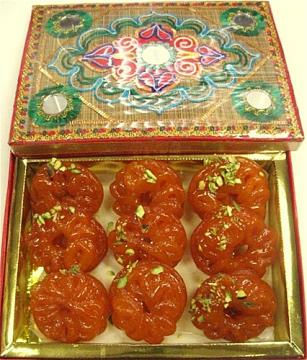 A traditional sweet that has a special place in the heart of North and South Indians. Making emarti is an art and requires special knowledge. Major Ingredients: Fermented Lentil (Urad Dal), Sugar, Ghee (Clarified Butter), Corn Oil, Almond, Pistachio, Kewara Essence. Store and serve at room temp. for best taste. All gift boxes are professionally shrink wrapped and includes greeting card with your message. The color and style of Gift box may vary from the picture shown. Great to send as a holiday or diwali, holi, rakhi gift. Buy Emarti Gift Box, 9 Pcs Box, Diwali Gift Idea, sold & shipped by Bengali Sweet House where you can shop online for Quality Indian Sweets, Snacks & Gift Baskets Shop - Bengali Sweet House. This Sweet Jalebi collection has been tagged as Send Gifts Usa, Jangeri, Imarti, Festival Shopping, Wedding Housewarming Return Gift, Party Favors, Gift Basket, Indian Sweets.